INDUSTRY.co.id - Jakarta - On April 5, 2018, a smartphone manufacturing company from Hong Kong, Infinix held a 'Hot Techno Update' event to share technology knowledge about hardware and software (hardware and software). 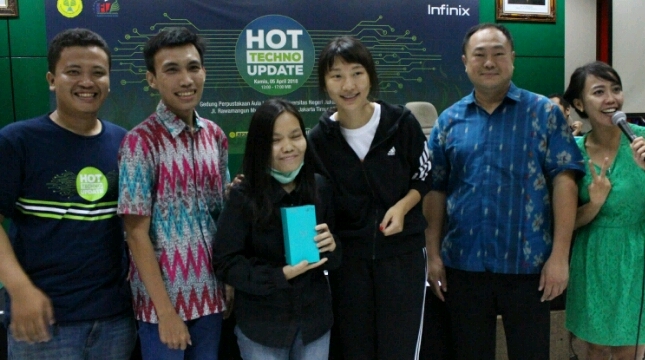 In addition to introducing Infinix Hot S3 Smartphone, the event also aims to get closer to Indonesian students and meet the demand of Infinix fans. Packed in a live presentation and demo format to feature excellent features of Infinix Hot S3, the event also works with Jagat Review, represented by Dedy Irvan who also has the opportunity to present useful insights about smartphones in general. While explaining the presentation of technology, several brief demos are also done, one of which is a demo that introduces the Face Unlock security feature on Infinix Hot S3 smartphone with base face recognition. The event opened with remarks from Marcia Sun, SEA Regional Infinix Mobile, as well as providing an introduction on Infinix Hot S3 and also shared updates on Infinix smartphone industry and e-commerce knowledge to students. In addition, Infinix also offers an internship program for students to intern at Infinix which is one part of the current Infinix program in Indonesia. "We are very pleased to greet our XFans at UNJ directly to share information and knowledge about the latest information technology. Infinix hopes to continue to strengthen our relationship with Infinix lovers, most of whom are millennials," he said in a press release to INDUSTRY.co.id, Monday (16/4/2018). "This event is one way to carry out our commitment to meet the demands of our customers," said Marcia Sun. "We have come to get closer to understanding their demands and needs." Meanwhile, a representative from Qualcomm, Susanto explained about Qualcomm Snapdragon and the advantages possessed in Infinix Hot S3. To add to the excitement of the event, after all the presentations and demo sessions are over, the event continues with games for the participants with the Infinix Hot S3 main prize. Infinix Hot S3, is the latest smartphone from Infinix which was launched in March. This smartphone has a 20MP front camera features and comes with 5.7inch screen and 18: 9 Infinity Display ratio. Hot S3 operates with XOS 3 and is powered by Android Oreo. In addition, Hot S3 is now equipped with Face Unlock feature for its security system.